Is There A Happy Medium Between Opt-In and Opt-Out? Watching Facebook struggle with Beacon brings me back to the early days of email marketing when we used to argue about opt-in, opt-out, and double opt-in. If you automatically enroll a user in an email marketing program and then require them to "opt-out", you build a huge list very quickly and eventually everyone views you as a spammer because very few users actually take the time to figure out how to opt-out. 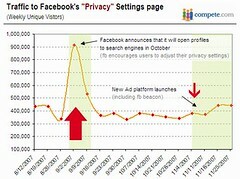 Here’s the traffic to Facebook’s opt-out page before and after Beacon was launched which shows that pretty clearly. Thanks to Dave McClure who posted this. If you do it the other way, asking people to join the list by checking a box, it takes forever to build a list. And if you go with double opt-in, asking users to confirm that they really do want to get your email, you’ll never build an email business. So every business wants to be in an opt-out situation but also wants to avoid the spammer problem. It’s not an easy place to get to but it can be done. What I like our companies to do with email is to grab the email address and make the user go to the setting page if they want to opt-out of getting any email. But I also advise them to send email very infrequently to people on the master list. When they do, they should offer the users the opportunity to opt-in to more frequent emails. And they should offer the users the ability to opt-in to emails on the site every chance they get. I like to think of this as a happy medium between opt-out and opt-in. Don’t ask people to opt-out, but treat them as close as possible to opt-out until they actually opt-in. How can this technique be applied to web-based profiling systems like Beacon? Not easily. I learned a lot about this while we were investors in TACODA, which is now owned by AOL. I feel very strongly that profiling people so that you can give them better and more relevant advertising is a good thing. I’ve written about that at length on this blog on many occasions. But I also think the users should know that’s happening and should be given an easy way to opt out. When it’s an ad banner that is being served to you based on your clickstream data, its one thing. But when the fact that you bought a gift for your girlfriend is shown to your girlfriend on Facebook, it’s another. So Beacon needs an even more granular opt-out mechanism. Ideally one that happens each and every time you do something that is going to be tracked. This is not an easy problem to solve. You don’t want to add one more box to check every time you do some transaction on the web. I don’t want to have to say "yes, I want to share this on Facebook" every time I hit play on some web music service. But I do want to be able to say "no, don’t share this gift I bought my wife on Facebook" every once in a while. I am annoyed that everyone is focused on the "mea culpa" side of this story. Young Mark Zuckerberg was a bad boy and we have to spank him. It’s ridiculous and smacks of jealousy to me. Facebook is trying to solve a really hard problem and I believe they are doing it to make their service better for their uses. I want the music I listen to shared automagically with my friends. And since I don’t listen to music on Facebook, the idea of a Beacon is a great thing. Of course they are going to make mistakes trying to get the balance right. But the impact of all of this pounding on Facebook is we’ll get less innovation out of Facebook going forward as they lick their wounds. That’s a bad thing.